Marieme D Hair uses great products with great results! Marieme D Hair offers a wide range of services that caters for each client’s individual needs. If it’s your first time visiting the salon and you are unsure of what kind of hairstyle to go for, we can talk you through the options during a free consultation. During this time, we can assess suitable products, colours, haircuts and styles that will suit you and your hair. Your hair will be washed and styled according to your wishes and needs. Depending on the desired style, hair texture and type, we use various techniques to achieve a particular look. This ranges from a curly blow dry, round brush blow dry or wrapped style. We use high end products for all are treatments and our range includes - Affirm, Keracare, Philip Kingsley, Natural oils, Inoar and Olaplex. If your hair is dry, brittle, weak and frizzy we have in stock the treatment that will be best suit your hair. This treatment is for customers that want the versatility of having naturally curly hair but would like the options of sometimes wearing it straight and silky. We offer two different strengths one that will keep your hair straighter for longer and another that will go back to your natural hair state much quicker. This treatment contains formaldehyde which gives hair a straighter longer lasting result. This revolutionary treatment reduces curl and volume by up to 70% and restores hydration and silkiness to the hair. Its formula is enriched with White Clay and Cocoa Oil that provides rich conditioning and frizz reduction. The result? A transformed head of hair that is sleek, smooth, and radiant. This new advanced formula can be used for all hair types and significantly reduces volume. It’s an oil that is super-fast, easy and safe to apply. This product has gone viral in the hair world and contains argan oil, cocoa butter, jojoba oil and other great ingredients. This great recipe produces an anti-frizz effect, shine, hydration and smoothness for the hair. If you’re thinking about changing the colour of your hair, we are ready to help you with that smooth transition. Fancy going bold or want to try a mix of tones? We offer several types of colouring techniques, from tints and highlights and use ombres and balayage. We also apply colour corrections and creative colours. We use excellent brands such as L’Oreal, Wella and Olaplex. Olaplex is an outstanding treatment which works by seeking out broken bonds in the hair that are caused by chemical, thermal, and mechanical damage. It’s the ultimate breakage insurance that the stylist can add to the colour mixture to prevent hair damaged. Whether you want longer and fuller hair, or just extra body, or even added colours, we have the techniques available to suit your needs. Our stylists are able to provide this service on natural Afro hair, processed Afro hair and European hair. Techniques used include: single plaits, cornrows, tracks (sewn on or glued), customised wigs, crochets, weaves and microrings extension which is most suitable for European hair. Let’s not forget that men want to have great hair too! 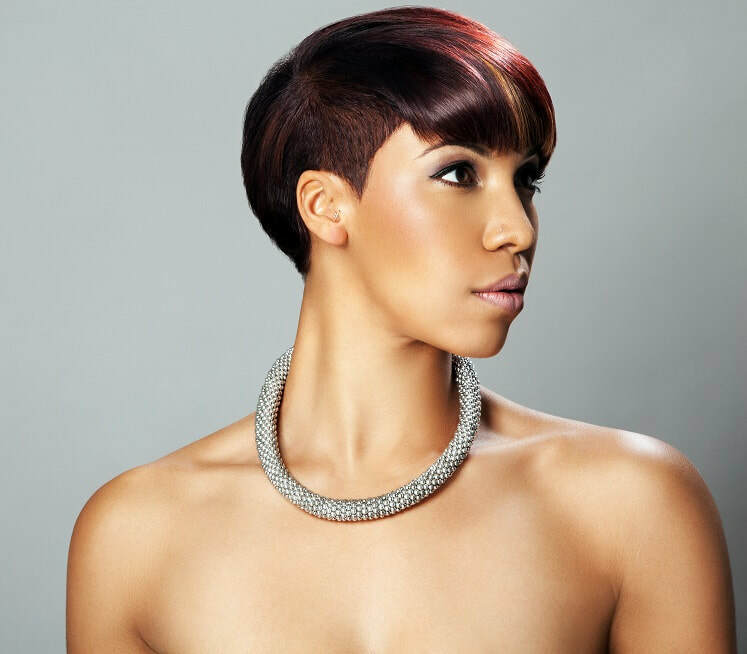 · we offer both scissors cuts and clipper cuts. Our little clientele are very well looked after and they will be made to feel at ease and enjoy their visit to our salon. Our stylists are very patient and gentle and do their best to ensure that every child’s experience is a great one! If you have any concerns about what treatment or style to choose for your child’s hair, book a free consultation so we can talk through all the options. We offer bespoke special occasion packages for: weddings, anniversaries, birthdays, hen-dos, leaving do's, christenings and other special occasions. We will cater to all your hair needs prior and at your big day. ​​The consultations and trials are done at the salon. We offer salon-based packages and also call-out packages. ​​​We offer competitive rates and can also arrange for our service to come to you. We cater for one-to-ones or larger groups of people either in the salon or at the location of your choice. We’ll be there to make your special event feel even more special as your hair gets the superior Marieme D Hair treatment!